You might already think Brighton and Hove were pesticide-free, I sure did until I saw them spraying in Saunders Park, Lewes road. A park with a children’s play area, dog walking area, natural flower beds and an edible garden. You can imagine why I was so shocked to see the council spraying! 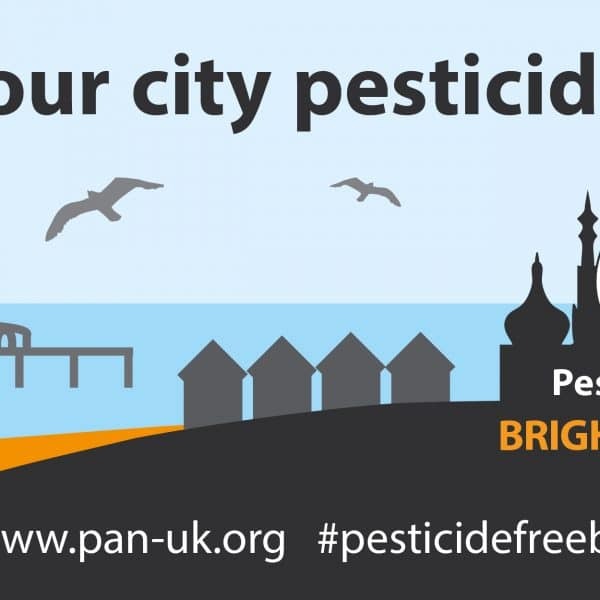 Pesticide Action Network (PAN) has seen great success over the years in getting councils around the UK to go pesticide-free and this time their eyes are on Brighton & Hove. Infinity Foods Cooperative wanted to help! Our windows are full of facts. We also have a selfie wall to show your support on insta and fb with #brightonandhovepesticidefree. and a table full of information and cards to sign so you can take the pledge and send a message. Brighton and Hove council spray pesticides in our urban spaces. These toxic chemicals get used around our parks, playgrounds, pavements and schools! These chemicals are linked to a wide range of health problems, and its children that are most affected. Exposure to pesticides is linked to serious conditions such as asthma, cancer birth defects and reproductive issues! It is not just us they hurt, pesticides are driving massive declines in species such as bees and hedgehogs and birds. we know that organic farming has 50% more biodiversity, so why are we still spraying our city? There are lots of alternatives out there. Hot foam can be used, made from vegetable oil, which is an excellent weed killer and has been approved by the Soil Association. High-Pressure hot water, similar to hot foam, but it is just water. Electronic control systems, this is a relatively new approach and is great at dealing with invasive species, its works by using electricity to boil the weeds from the inside out from the root upwards. And good old hand weeding, but many weeds also can just be left to provide a natural habitat for our wildlife. If you agree, like us and want to see a Pesticide-free Brighton & Hove, come in the store and sign one of the pledge cards to send a message to the council. And on the 2nd May when choosing who to vote for consider the candidate that has made the pledge, to find out who has pledged in your ward visit PAN – Brighton and Hove.